At Snowgoose, we believe the hamper experience begins the moment we place your gift in their hands. 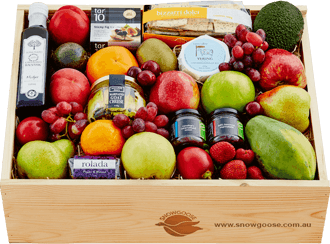 Your selected produce arrives exquisitely presented in our iconic wooden hamper box, branded with the Snowgoose marque of authenticity to guarantee the freshest gourmet experience. Upon opening their hamper gift, they'll discover incredible produce carefully nestled in straw for a stylishly authentic farm-fresh look. What's more, because we hand pack each gift basket and hamper to order, we can guarantee a perfect experience every time. Birthdays, anniversaries, get well gifts, thank you gifts, congratulations, baby gifts, corporate hamper gifts, or for creating your own occasion to treat someone with a unique hamper gift idea. We design our Gift of Taste hampers to surprise and delight; to congratulate, commemorate, celebrate or create unforgettable occasions. Browse our gorgeous hamper collection and you'll discover heavenly ways to say Thank You, wish them a Happy Birthday, indulge them at Christmas, and celebrate New Arrivals in style. Our hampers are also the most thoughtful gifts to send messages of Condolence or to wish someone better. For corporate gifting, we're delighted to introduce our latest Corporate Gift Hamper Collection, teeming with indulgent fruit gift baskets and hampers that help your business to stand out from the crowd. We can organise the branding of your logo or message on our Snowgoose lids to make your business even more memorable. Look no further for a deliciously unique gift idea that celebrates Easter. This hamper guarantees to thrill. 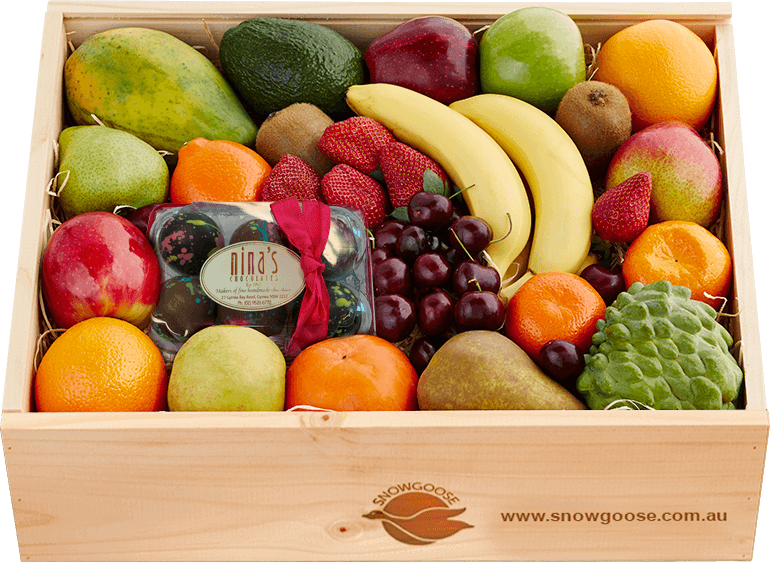 The stars of this beautiful display are our famous Snowgoose fruits, handpicked at the point of perfection to deliver orchard aromas and mouthwateringly fresh flavours. Nina's master chocolatiers have put together a personal selection of their Easter eggs, handmade in Australia using a base of imported Belgian couverture. Winners of over 100 awards, every irresistible chocolate creation follows Nina's founding philosophy that the chocolate experience begins with eating with your eyes, followed by a taste sensation that instils a sense of wonder. Sweet and generous, this luxurious hamper is crowd pleaser! Australia’s original and most-loved signature fruit hamper awakens the senses with its abundance of mouthwatering seasonal delights. We believe the quality of produce you give reflects how you feel about your recipient. That's why this gift hamper showcases only the finest quality and most flavoursome fresh fruit. We pick our fruit at the precise point of perfection and nestle each piece to create a vibrant display in our iconic wooden boxes. How wonderful it is to know that in this hectic world, your recipient will be able to relax and indulge in flawless fruit, plucked from the trees just 48 hours beforehand! In Italian tradition, this gourmet antipasto gift treats taste buds to a feast of complementary textures and flavours. 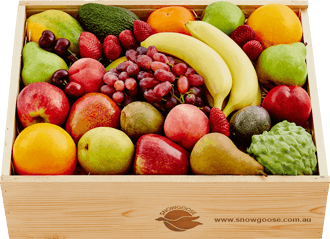 Ready to serve straight from the hamper, the banquet begins with a colourful selection of our legendary Snowgoose fruits, revered for their mouthwatering flavours. To accompany our just-picked fruit, each lucky recipient will savour a selection of Salumi Australia's incredibly tasty artisan meats, created by Sardinian-born Massimo Scalas, Salumi's Sobrasada, a spreadable paprika-filled chorizo, together with Cacciatorini, a small rustic salami and slices of Pork Lonza, a peppercorn and juniper berry cured and aged pork loin, the addictive Meredith Dairy Marinated Goat Cheese which tastes divine on the artisan lavosh with Three of a Kind olives from Stubborn Olives in Sydney, on the side. Generous and thoughtful, we guarantee this Gift of Taste is one they'll always remember. Please note that currently this hamper is not available for same day or next day delivery in Melbourne metro locations. A joy to give and an absolute delight to receive, this heavenly gift hamper showcases an irresistible selection of our latest sweet artisanal discoveries. Greeted by a most vibrant display, your recipient will be able to indulge in the sensational orchard flavours of the finest fruit, plucked from trees just 48 hours beforehand. A delight for the most discerning sweet tooth, the hamper contains a personal selection of their handmade Belgian chocolates and aTurkish Delight Bar from the master chocolatiers at Nina's, together with a generous wrapping of White Chocolate Honeycomb to feast all the senses. To complete this tempting hamper experience, we've added utterly moreish Nougat Noir, handcrafted by Chris Edwards, one of the world's leading pastry chefs. This indulgence is simply the most generous and memorable banquet for sweet taste buds. 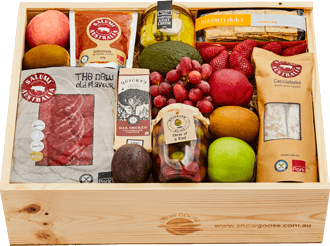 This indulgent gift hamper showcases our passion for the finest quality produce, captivating taste buds with a profusion of complementary flavours. Nestled in the straw of our beautifully presented box, there's a display of our finest in-season fruit to discover, plucked from the trees just at the point of perfection. Ready to serve on a plate right out of the hamper, a feast awaits with Yarra Valley Dairy's buttery Yering™ cheese, handmade using milk pumped fresh from the milking sheds. Tasmanian Gourmet Kitchen's savoury beetroot marmalade and caramelised onions taste exceptional spread on handcrafted Lavosh from Bizzarri Dolci's kitchen. Together with divine Sticky Fig and a drizzle of Joseph Olive Oil, the lucky beneficiary will be able to relax and indulge in the most unforgettable way. 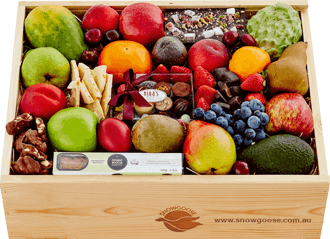 Paying homage to our Snowgoose origins, this fresh hamper experience makes the most delectable gift idea for every occasion. We've selected a bounty of our famous fruits, revered for their orchard aromas and just-picked flavours. 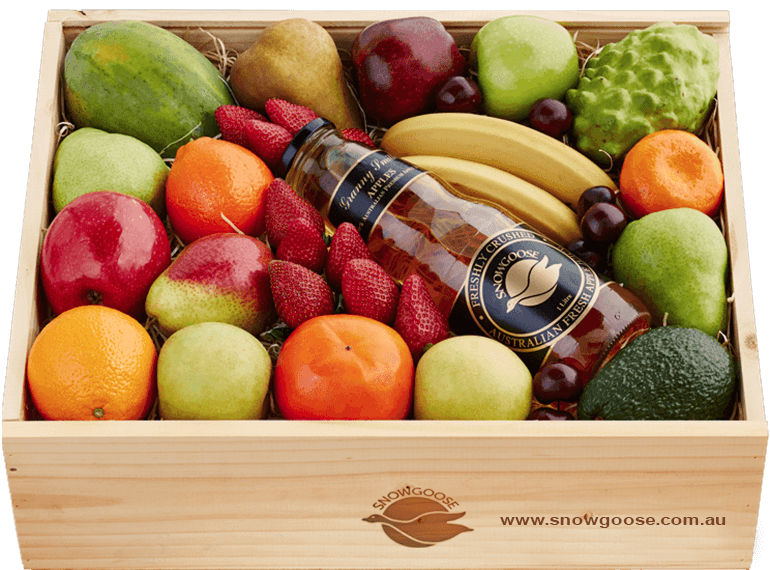 Nestled amid our flawless fruit, there's one of life's great pleasures - our famous Snowgoose 100% pure, fresh varietal apple juice. We crush and filter the finest quality apples through a wine press to create a clean, crisp taste that's ripe for the drinking! It’s a beautiful alternative for those who don’t drink alcohol, yet still thirst for something special. 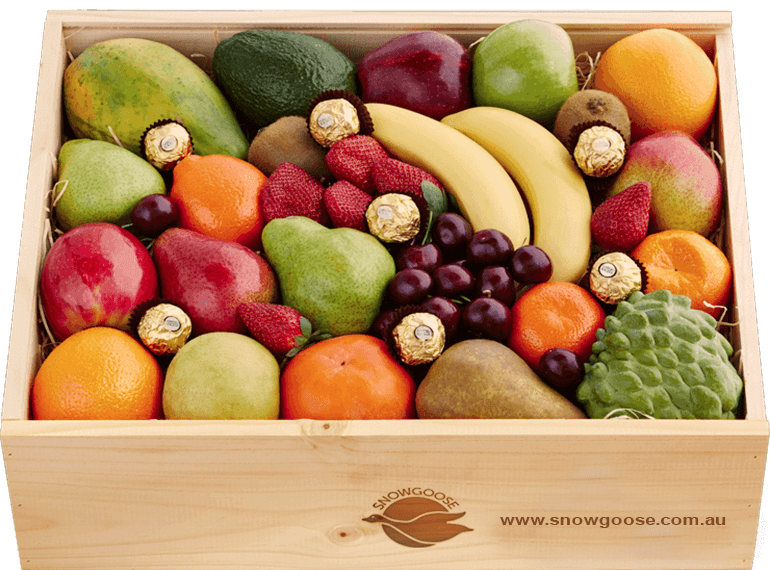 Australia’s original and most-loved fruit hamper is destined to delight with its bounty of fresh seasonal produce and a golden sprinkling of world-famous Ferrero chocolates. We believe the quality of produce you gift reflects how you feel about the recipient. That's why this gorgeous gift hamper showcases only the finest and most flavoursome fresh fruit. We pick our fruit at the precise point of perfection and nestle a vibrant display into our signature presentation boxes. How wonderful it is to know that in this crazy-busy world, your recipient will be able to unwind and indulge in flawless fruit, plucked from the trees less than 48 hours beforehand! Generous and thoughtful, it's one of our all-time bestsellers. If you’re searching for a deliciously unique gift idea that celebrates and marks every occasion, this hamper guarantees to thrill. 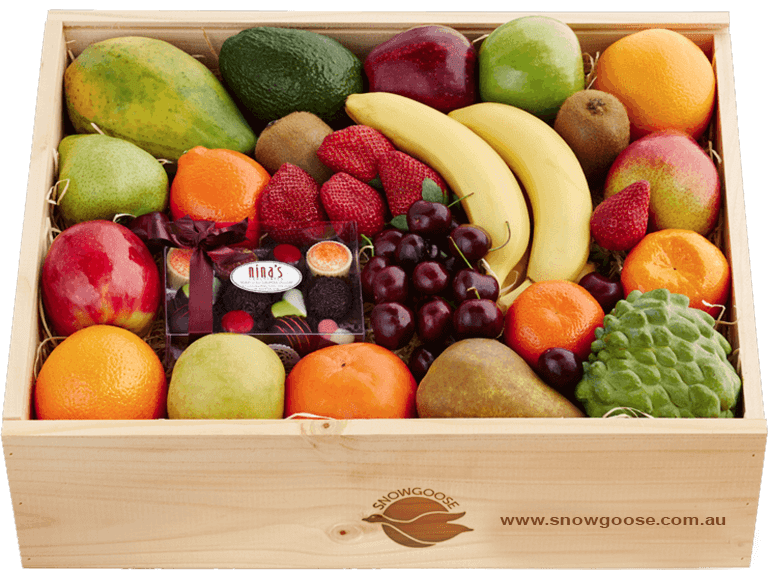 The stars of this beautiful display are our famous Snowgoose fruits, handpicked at the point of perfection to deliver orchard aromas and mouthwateringly fresh flavours. Nina's master chocolatiers have put together a personal selection of their chocolates, handmade in Australia using a base of imported Belgian couverture. Winners of over 100 awards, every irresistible chocolate creation follows Nina's founding philosophy that the chocolate experience begins with eating with your eyes, followed by a taste sensation that instils a sense of wonder. Sweet and generous, this luxurious hamper is one of our all-time bestsellers!